When it comes to decorating your home office, you are the boss, and no one can tell you what pictures to hang, color schemes to adhere to, or types of furniture to get. And one of the most important pieces of furniture in any office is the office chair. 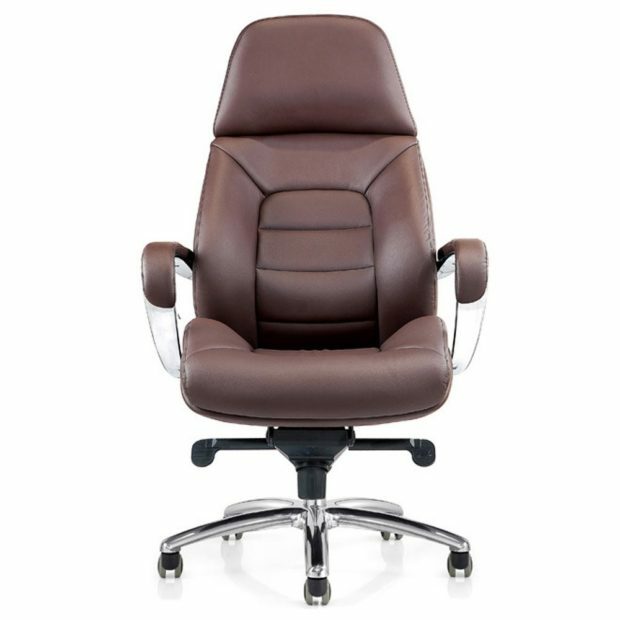 If you’re going for an executive look, we have 5 of the most extravagant, comfortable real leather chairs for you to consider. Looking for an office chair that, well, doesn’t look like one? 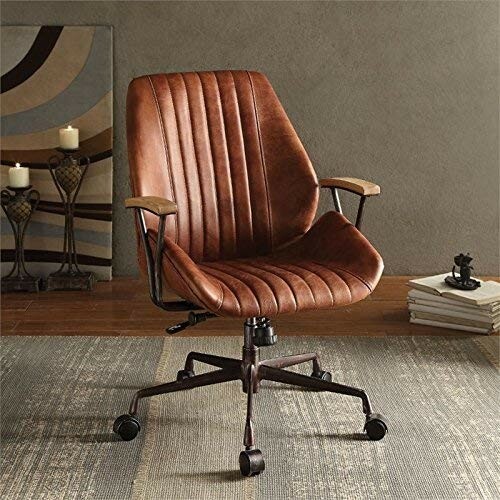 The Acme top grain leather office chair is the perfect blend of high end leather and old country looks that departs from the standard office chair. 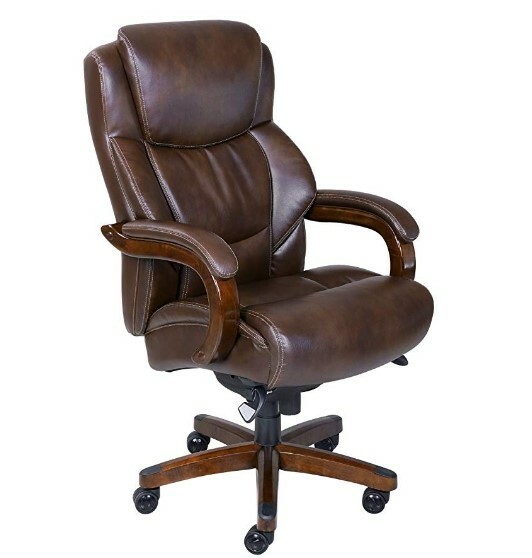 This adjustable swivel chair has warm golden-brown colored leather upholstery with cushioned long stitched stripes. The chair comes with metal framed armrests for superb comfort. With a pneumatic lift, adjust the height of your chair to suit your body size. The Gates Leather Office Chair carries the look of a high end office chair well with its top grain leather and eye catching chrome skeleton. Measuring 28.08(W) x 29.64(D) x 47.97-51.09(H), this chair from Zuri Furniture has padded armrests as well as adjustable height with its 4-position lock and chrome gas lift. The brown shade is a warm, trendy and popular color choice, but you can take your pick from cream, white, black or orange. Sleek and professional to look at, the swivel-base chair with PU castors has an ergonomic design, waterfall seat, and protruding lumbar support. The company X Chair focuses on high end ergonomic chairs, similar in quality and function as other reputable companies such as Herman Miller. The adjustable premium leather X Chair, with DVL or Dynamic Variable Lumber support molds to the shape of the person’s body, providing superb lumbar support to the user. The chair also comes with a height-adjustable back and headrest. The armrests are 4-dimensional and can be locked into many different angles that you prefer. This chair, available in a host of trendy colors, come with a range of health benefits, especially for people with back pain. Its SciFloat Infinite Recline technology and high degree of recline keeps your back in constant movement, and reclines up to 138 degrees, the ideal angle to release stress on the spine, according to this review by ErgonomicTrends.com. Hekman Furniture Company, opening way back in 1922, has maintained the hallmarks of excellence decade after decade, and the company is recognized as one of America’s premier furniture suppliers. Their office chairs have the finest in quality casegoods and fine upholstery. Their Coffee Leather Executive Chair with seat width of 18.25″, is made with beautiful and robust genuine leather. There is a pneumatic lift mechanism for you to adjust the chair to suit your height. The chair also has a knee tilt mechanism which allows the user’s feet to remain flat on the floor when the chair is tilted backward. The chair with its ribbed back and antique brass nailhead trim means you get function and beauty rolled into one. The 5-point wood base chair with casters will require some assembly. 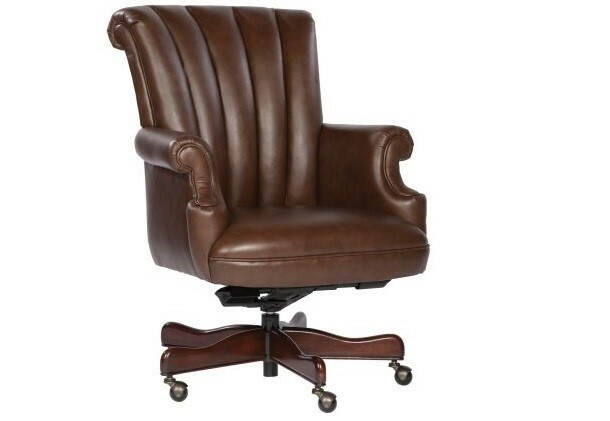 This stylish Big & Tall Executive office chair luxurious bonded leather also comes from a familiar household brand. La-Z-Boy. With this fully adjustable chair for a personalized fit, you can expect exceptional support and comfort. This is because of the ComfortCore Plus where you get superb cushioning with the advanced Memory Foam layering system. The padded headrest provides neck support for prolonged sitting. 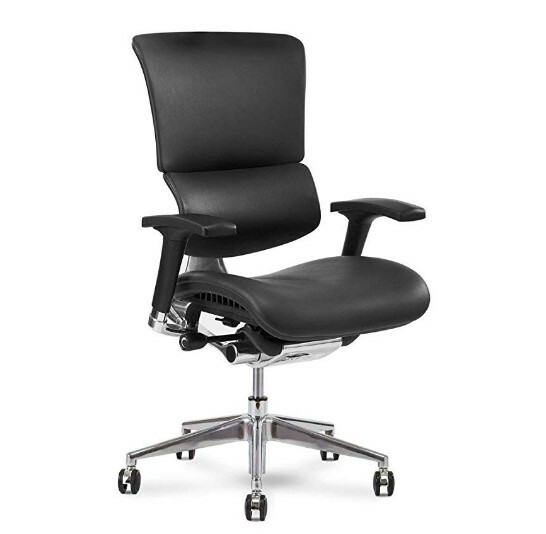 You’re able to control the height of the chair and tilt it for perfect body alignment, and the contoured lumbar area gives you lower back support to alleviate all discomfort. The spacious seating area with waterfall seat edge can accommodate up to 400 lbs. The chair has a thicker plywood subcore as well as heavy-duty castors to comfortably and safely see you through your entire day. Every hardworking person deserves a little luxury in their lives, and if you’ve got a full 8 hour working day ahead of you, you want to make sure they’re healthy hours where a comfortable posture ensures you remain pain free. These beautiful leather chairs are all adjustable and supportive, providing you with plenty of options to remain healthy as you work, but to also have a chair which can be admired just because it provides some instant luxury and glam.